Importantly, Osiris has partnered with Genzyme, a niche-disease development expert, for developing Prochymal as a therapy for nuclear assaults or other radiological emergencies. Genzyme brings critical know-how to the table for developing products in markets with few patients. Since ARS is not a common affliction, it is impossible to run a clinical trial on humans with this disease. The plan is to obtain FDA approval for a disease with similar gastrointestinal problems (Crohn’s disease), and then perform large animal studies where the animals have been exposed to radiation and treated with MSCs. 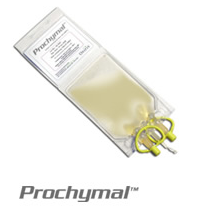 Prochymal is in three separate Phase III trials (Crohn’s, and 2 different graft vs. host disease trials), as well as earlier phase trials for cardiac regeneration and Type I diabetes. This funding is important as it sounds like it allows Osiris to be reimbursed for the remaining development costs for at least one of their Phase III trials as they polish off their clinical development and begin applying for biological license approvals (BLAs). For those not in-the-know; a BLA is required for going to market with a drug and begin earning revenue. Osiris has also partnered with the Juvenile Diabetes Research Foundation to curb development costs for Prochymal in a Phase II Type I diabetes trial. Osiris has been beaten up by the press for their lack of money in the bank while they spend ~$10M every quarter, putting the long term viability of their business at risk. However, these deals and contracts allow them to recoup a good portion of what they are spending, reducing their burn rate and buying them time for when revenue will begin to come in, likely sometime in 2009. Osiris seems to be putting together a well diversified revenue generation plan to keep the business funded until they are able to bring Prochymal to market in a substantial indication, such as cardiac or diabetes. This is especially important in today’s capital markets that are not being kind to non-revenue generating industries such as stem cells. Now, if Prochymal proves efficacious in the many trials it is being tested in, then it looks like Osiris increases it’s chances to live to see the day that money starts to roll in from product sales. This entry was posted in adult stem cell, business models, Clinical Trials, DoD, MSCs, Osiris, Regenerative Medicine, stem cells and tagged Acute Radiation Therapy, DoD contract, Mesenchymal Stem Cell product, near term revenue, Prochymal, Type 1 diabetes. Bookmark the permalink.